Crescent City - New Orleans, Louisiana in 2013. (Groan) 4:45am for the taxi -- and he's early! After a 75mph+ ride to Sea-Tac, we check one bag on United for $25. TSA separates me from my luggage, sending me one way and the bag another way, but I outsmart them and get it back. The main concourse food court Starbucks has no breakfast sandwiches, so instead I have a full eggs/sausage/potatoes/biscuit and OJ meal...from a Japanese Teriyaki place! Pretty good too. Baolu has her standard Starbucks vanilla soy latte with the terribly-health oatmeal/granola combo. It is a completely sold out United flight 776 SEA to DEN. All are on board when the little twit across the aisle realizes she left her Toshiba laptop at TSA...and she doesn't know which checkpoint she came through! (there are 3 checkpoints). So get this. The plane's CAPTAIN physically went and got it from TSA! Despite the delay, we managed to leave OT and got into DEN 20 minutes early. As we found out, there is some REAL PAD in United's schedules. We rolled up to the gate at Denver International, unloaded, and had nearly 3 hours to kill. For lunch, we ate the store-bought sandwiches we brought along. Denver airport has this huge shopping mall which we toured to stretch our legs. Had a spicy bloody Mary and wine at the 5280 bar to kill time (5,280 feet/one mile above sea level, get it?). A very "metro" bar, but good drinks. B's wine was local - called something like Infinite Monkey Theorem white wine, with grapes from the Grand Valley which I guessed, correctly, is out by Grand Junction near the UT border. My gianormous Bloody Mary had practically every cocktail vegetable you could imagine (olives, string beans, celery, onion, etc.). Plane DEN to MSY, the seats are MUCH smaller than SEA-DEN's A320. I'm seated next to some Naval Officer sitting center seat defiantly with both elbows way over the arm rests. He is digging his elbows into my ribs with gusto. I switch seats with Baolu who's got the other aisle seat - much better. Also, before we switched aisle seats, an old lady marches up to Baolu and says loudly, "OH, YOU'RE IN THE WRONG SEAT!" The stewardess quickly corrected her --- SHE was in the wrong seat (window, not aisle). We are seated in the very last row on the airplane. As we approach NOLA, both Lake Pontchatrain on the left (with the causeway in the middle) AND the water to the right (Gulf of Mexico?) are very muddy looking. Before I realize it, we thump down on the runway. Lafayette, We Are Here! MSY airport is very small and very old. Bathrooms are tiny (4 stalls), dirty, and a disgrace. Absolute mob scene at Baggage Claim. People are stacked up five deep to get their bags. As we're standing there, some guy from Phoenix walks right up and just starts telling us all about his luggage problems on his connecting flight -- he won't shut up! Baolu smiles politely at him and then I mention we want to move over there to see if our luggage has arrived. We escape. Yes, I do seem to attract these people. It turns out, you WALK to the rental car counters! No shuttle. Outside it is a very pleasant 75 degrees and sunny - not muggy at all as I had feared. We spend about 45 minutes at the Hertz counter - one of the gals is new and is constantly asking the other gal question after question. The line moves agonizingly slow. Luckily, we get the gal who knows what she's doing. They give us a big, gray, Toyota Camry. We try out the Google Maps Nav system on my iPhone, who's female voice we quickly name, THE BETTY (or something similar -- use your imagination). We confuse the "Betty" by taking a few detours along the way to buy gallon jugs of water at a nearby pharmacy. We keep passing paycheck loan stores - must be a very tony neighborhood. The "Betty" seems to be a little slow -- several times on this vacation, she tells us to keep right about a quarter mile AFTER the fork in the road. And The Betty pouts. She won't talk to us for long periods of time. Bettys aside, we get on I-10 right into a traffic jam. Looks like they are rebuilding parts of I-10. Finally get through the slowdown where it magically just opens up. New Orleans DOT thinks they're so smart. Instead of saying "French Quarter", ALL the exit signs say VIEUX CARRE. What the hell is a Vieux Carre? A View of Carrie? It turns out it just means French Quarter. I'm sure the highway department has a hearty laugh about all tourists they send to Slidell instead of their downtown hotels. We exit and you start seeing all these characters -- in costumes -- in drag -- wandering around the exit ramp. It turns out everyone is dressed up for the Saint Patrick's Day celebration this weekend. I'm following The Betty to the letter -- based on our hotel's street address -- it turns us down this dark alley -- um, really? Dumpsters galore. Questionable characters give us the once over. But no, it is the Courtyard by Marriott -- a clean, well-lighted place, hard up against the New Orleans Ritz Carlton which dominates the block. It's valet parking only at our hotel, so I turn over my car and keys. The actual lobby is on the 2nd floor after a short elevator ride. We are quickly checked in and soon in our room. Off to dinner! It's been a long day and later in the evening than we normally eat. Bourbon Street is only a block and a half away and it is jam packed with green-clad revelers. In fact, Bourbon Street is blocked off to traffic, there are so many drinkers and partiers - this place puts Las Vegas to shame for pure debauchery. There is a long line at both Felix and Acme Oyster Houses as it is well past 7pm. We put in our name at Bourbon Seafood House and 45 minutes later, they text me. We start off with some oysters to go with our wine. The oysters are huge! Gigantic! We order 2 dozen of the shellfish - I've never seen them so big. They are large, but not as tasty as the ones we get in the Pacific Northwest. The provided cocktail sauce and horseradish helps them a great deal. I hate to sound snobbish, but raw Pacific NW oysters, are more exquisite. French bread comes in a little paper bag and is delicately soft and warm - much better than most restaurant bread I've ever tasted. I have the fried dinner combo (shrimp. oysters, catfish and of course, hush puppies -- all fried up on a bed of "pommes frites" (French fries). Baolu has the blackened Catfish on a bed of rice. Good service and good food at this place. They keep our water glasses filled and we both have a glass of white to wash down the seafood. Yes, we're both wearing green today and at Baolu's request, we're tromping over, first thing, to the world-famous Cafe Du Monde just off Jackson Square. Even at 9am on a Sunday, the place is busy. Outside seating is packed. There's a long line at the take-out window. We sit down inside and it is like an icebox! Must be 55 degrees in here. They've got the a/c on "deep freeze". They do only two things, but they do them very well. First is the chicory coffee with milk (cafe' au lait), and second is their beignets - covered in a veritable snowfield of powdered sugar. A beignet is sort of a French donut, but somehow different. It tastes like a very light cake dough. And it is VERY fluffy, warm, and yummy. At Nod's insistence, (HI NOD!!!) we ordered TWO portions each of the beignets for a total of 12 (I had 7, B had 5). OK we have to walk this off. First we walk through the French Market, then the flea market -- both of which are still setting up their wares. It is only 9:30 am and everything, except for the Cafe Du Monde, is closed. New Orleans really doesn't get going until around 11am. We walk over to the last stop of the waterfront streetcar. The platform kiosk says the streetcar fare box will take a $20 bill. Our streetcar driver has other ideas. She says that this is NOT the case, and if we don't come up with a fiver and a one for two all-day passes, she is going to THROW US OFF at the next stop. I fumble with my wallet and just in time, I come up with the money. Cranky streetcar motorman (motorwoman?) notwithstanding, it is a fast ride along the waterfront to the foot of Canal Street and the Mississippi River. It looks like the ferry ride across the river is closed until 11am -- we will have to come back later as the terminal is proudly guarded by two derelicts sprawled across the entrance. At another portal, bums are a-snooze on the benches inside the terminal. It is gated off and appears to be deserted except for the winos. We walk along the misty river. A Norwegian cruise ship is moored alongside near the US 90 bridge over the river. Next it's time for a ride on the famous St. Charles Streetcar Line! we stroll up Canal street to St. Charles Avenue and hang a left. There is a huge group already waiting for the streetcar. We wait. And wait. And wait. After about 20 minutes, one finally comes around the corner. It is packed. We force our way on. An elderly woman hip-checks B off of her overhead strap and onto the back deck of the streetcar. We finally decide to get off at the very next stop. We wait about 5 minutes and here comes another one. This time only half full, HA! Many people jog on the streetcar tracks. This guy kept up with us for at least a mile. It is a very enjoyable ride around Lee Circle, through the Garden District and ALMOST to Audubon Park. About a mile short of that, they run shuttle buses the rest of the way. They are still cleaning up the St. Charles Line from the effects of Katrina. You can see both tracks are still buried and they are slowly digging it out and repairing the track. Back on St. Charles Avenue, we have a hard time guessing where the shuttle bus will stop. We walk to a "Car Stop" sign and wave at the next bus -- actually he puts his 4 way flashers on long before I waved him down. I think he's used to confused tourists. We saw lots of people doing the same thing. Back to the streetcar pickup area, They are loading one already packed with a full load of babbling girly-girls talking LIKE I MEAN SO TOTALLY GROSS, so we take the next one. Much better. Can ride in peace now. Emeril's Delmonico. A surprisingly small restaurant considering all the fuss they make about him on TV. And way far away from the French Quarter where all the action is. Baolu not impressed. We get off just before reaching Canal Street -- and there is the Streetcar Cafe. A little dive with one table left. It is very hot in there, but the wait is worth it. We had Alligator balls, Crawfish pie, and two of the most delectable Po' Boy sandwiches you can imagine. I had a fried oyster, bacon, cheese, mayo, Po' Boy that was simply out of this world. THIS is the way to enjoy the local oysters. Baolu was groaning over her fried oyster/catfish Po' Boy. Words cannot describe how good those sandwiches are. The bread was so soft and flavorful. This place should be on America's favorite drive-in's diners and dives. We waddle down Canal Street wanting to take a ferry boat ride to Algiers. It's still closed! At 2 in the afternoon! Maybe the captain and first mate never showed up. The whole place is locked down. OK, back on the street car to French Market/Flea Market for more browsing, then. We walk around Jackson Square and visit the really cool Saint Louis cathedral. Well lubricated now, we head back to the room for a quick rest. Soon it's feeding time and we head out early (before 6pm) to the Gumbo Shop. All the action is up on Bourbon street, so we get right in over on St. Peter Avenue (no line). Dinner is fantastic. As you can see, Baolu happily got her frou-frou drink. Behold gumbo, fresh bread, and a couple Creole combination plates -- jambalaya, red beans and rice, crawfish etouffee, shrimp creole, turnip greens...STOP IT, you're making me hungry!!!! For excitement, we had the drama going on at the next table. Two older froggie ladies are babbling in broken French. I hear an occasional "n'est pas" and "Je ne sais quoi" coming from them. They both enjoy full meals. Once finished, the eldest of the two hens waves over the waiter. In a loud voice she pipes up, "I WANT FEEESH!" The waiter asks what kind she wants. "I WANT FEEESH!!!" They go back and forth like this for a while. "Ma'am, you have to tell me what you want! - Look, I'll get you a menu and you can tell me". "I WANT FEEEESH!!!" Her friend translated for her. It turns out she wanted blackened catfish. She must really be hungry. Two dinners. For dessert, I have praline ice cream and Baolu opts for the bread pudding - small portions mercifully, as B is starting to groan from all the food we ate (she wasn't really hungry!). As we pay our check and leave, there is now a huge line extending down a long hallway and out into the street waiting to get in. As we walk past the end of the line, someone pipes up to me, "Is it good? Is it good?" I assure him it is awesome. We bypass Bourbon street and head back on the much-less-crowded Royal Street to the hotel. A very full day! We are off to Baton Rouge today, but FIRST, Lindsay wants to drive the causeway which crosses the middle of Lake Pontchartrain. All 26 miles of it. Baolu snaps some shots as we thunder across at 70 per. In a trice, we are on dry land at Mandeville, and after a confusing tour of access roads, land solidly at a great, Southern institution, WAFFLE HOUSE! (sausages/bacon came just seconds after this picture was taken). Our first taste of real grits with butter -- oh so good. We both had pecan waffles with chunks of nutty goodness inside. Pretty good for a roadside diner. Might have to come here again, if we have the time. Soon we're blasting along I-12 to Baton Rouge. We follow the Betty's directions on my iPhone which steer us through the LSU campus where, after a few false turns, find ourselves outside the LSU sports store and the enclosure of "Mike the Tiger". Mike is sprawled in a corner of his terrarium, where you can sort of see him -- and you can definitely SMELL him. Sleeping appears to be the order of the day and old Mike tries his best to get comfortable, rolling from side to side and generally ignoring everyone. What a life! After this quick tiger spot, we move to the sport store. B doesn't buy much gear here as it is mostly labeled for LSU. Back to the tiger cage and not a whole lot has happened since we left. Baolu issues some instructions, "All right GET UP, you lazy Tiger!!" but Mike is just not interested. Next stop is the Baton Rouge Zoo, up north of town. Being that it's Monday, the parking lot is pretty empty, save for one school bus which leaves shortly after we arrive. We buy our tickets and it's a short walk to the Tiger cage. This fella is from Malaysia and he's wearing a path in the dirt, much like the old cartoons, where he's pacing back and forth. He seems to be keenly interested in something outside his cage. We figure it must just about be chow time and he's waiting for the other steak to drop. The loudspeakers are playing this faux-Chinese music (lots of twanging and plucking of some sort of string instrument) which they repeat over and over. Very annoying. They seem to get along pretty good, but one of them begins very slowly stalking towards Tiger 1, then suddenly charges...and runs smack dab into the fence "WHACK!!!" Ouch. That's gotta leave a mark. You think by now they'd realize there's a barrier between them. Silly Tigers. We spend a good hour Tiger watching, suffering the bad fake-Chinese music, then it's time to go ride the little kiddie train they have, which circles the zoo. Now it's early afternoon and I ask B if she'd like to try Acme Oyster House in B.R. or head back to NOLA? Baolu opts for the Parkway Bakery and Tavern back in NOLA. Their gumbo is fantastic and so are their Po' boys. Baolu really liked this place! It is a quick and tasty breakfast at our hotel's 24 hour Starbucks. Best breakfast sandwich I've eaten in a long time - made with toasted white bread, fresh lettuce tomato, egg, bacon and cheese. Wonderful! Baolu had her de rigueur yogurt cup and Starbucks coffee. Off we go down I-10 West, I-310 south, then US 90 West. US 90 is an old, 4 lane they're slowly upgrading so it becomes a part of I-49, which starts up near Lafayette, LA. The older four-lane sections provide a dandy place for the Louisiana State Police (Barracks B according to the sign on the road) to set up radar traps. The speed keeps jumping up and down from 45 to 65 to 60 to 50, rinse, repeat. I count at least 5 LSP in a 20 mile stretch -- all with a car pulled over. This really bothers Baolu. As you can see, I finally pulled over for a picture. Keep in mind, it is 83 degrees, sunny, and we are in southern Louisiana. How much ice do these people get (other than in their drinks)? Maybe for 30 days around New Years? Anyway, our first stop is for lunch at Landry's "not-the-chain" in New Iberia, LA. This is western Louisiana in the heart of Cajon country. As you walk in, there's a chalk board by the door announcing 3 lbs. of boiled Crawfish for $12. Ooo! Ooo! Mudbugs are in season! we walk in. They seat us. I ask about the offer at the front door. "I'm sorry, we're out of those". Augh! It turns out they're only out of boiled crawfish. Baolu starts us off with some alligator. We both have gumbo (of course). I order the combination Crawfish dinner which is basically crawfish everything (gumbo, jambalaya, etouffee, baked in a green pepper, in a small pie, etc.). It is a gutty meal and very delicious. As we stroll out to the car, we watch these turtles swimming around in the pond below (mmm.... turtle soup!). Off we go to the Tabasco Factory. To get into Avery Island, you have to pay a $1 toll -- then it's up some gravel roads to the plant tour. After stashing the goodies in the trunk, we take the tour. We watch a little film and it is apparent the Mcilhenny family has been doing this since just after the Civil War...and they use old Jack Daniels Whiskey barrels to stash it in whilst it ages. How cool is that? No wonder it tastes so good. It is getting into the afternoon, so it's time to press on for the Nottoway Plantation. We had several plantation tours to choose from, but Baolu insisted we visit Nottoway. It turns out her current boss is an ancestor of one of the original owners of the plantation. It is located downstream on the west bank of the Mississippi about 25 miles from Baton Rouge. The original owner planted sugar cane. We wander around for a few shots of the magnificent building. Soon, our tour guide, Tessa, arrives dressed in an fancy gown. She lets us in and we tour the various rooms. After the tour, we decide to stay and have dinner before returning to New Orleans. To start things off, a Sazerac for Baolu and an Old Fashioned for me. Dinner tonight is good. Stuffed chicken breast for me and shrimp atop grits for Baolu. The big surprise is a Washington State wine, 14-hands Cabernet Sauvignon! I am on that. we both are. Dessert is banana foster cheesecake for me and bread pudding for Baolu. After dinner, it's a 90 minute trip back to the hotel in the dark. Just leaving White Castle, LA at sunset, I spot a UP freight going upriver with a sensational 5 chime horn - I wish I would have taken a movie instead of just a picture - simply to capture those horns! We are taking a road trip eastward along the Gulf Coast today and introducing Baolu to two new states, Mississippi and Alabama. Houses up on pilings are everywhere along the way. After crossing the Pearl River, we are in Mississippi! There's a chilly wind blowing and the rain has begun to fall as we pose for pictures. The precipitation makes us feel right at home. That's the Gulf of Mexico behind us. It is pouring down rain as we pass the famous lighthouse in the middle of US 90 at Biloxi, MS. 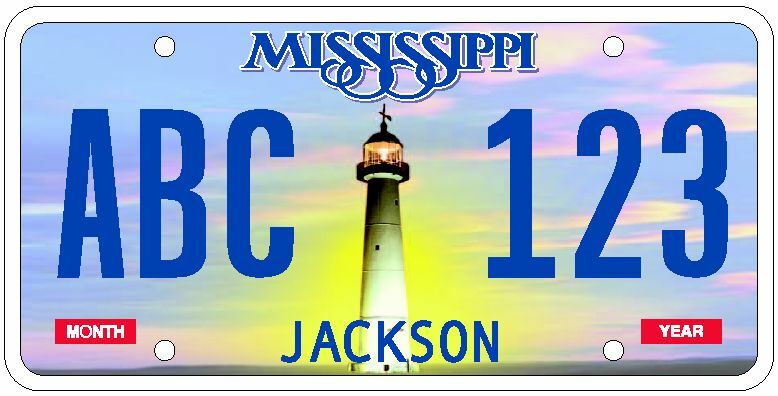 This is the lighthouse on one of the Mississippi State license plates. A few more bridges to cross and we are in Alabama. We both have the Spicy Deluxe Chicken sandwich with sweet tea and waffle fries. The sandwich is outstanding. 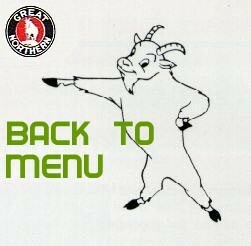 We go back for a second sandwich each! As we're chowing, a Chick-fil-a asst mgr stops by (she sees me taking pictures of the eats) and we explain we came all the way from Washington State to try one of their chicken sandwiches. She is impressed. Dinner tonight is the famous Acme Oyster House on Iberville Street. You have to stand in line to get in -- even at 5pm. Just like Las Vegas you can carry your booze down the street, as long as it is in a plastic cup (bottles not allowed). Back to the room. Tomorrow -- More stuff around New Orleans! We're just spending the day in New Orleans. First thing on the agenda is a stroll down Canal street to take a ferry boat ride. Err....how do you pronounce THIS street? Don't know. We got down to the Mighty Mississip, and watched a tugboat shove a barge upstream with our ferry boat loading across the river. It's a beautiful morning for a boat ride with a great view of the New Orleans skyline. The price is right, too. FREE for walk on passengers. The most interesting souvenir picked today? Baolu's mask! Dinner tonight is at "The Court of Two Sisters". I've no idea where Baolu finds these places, but she does. Probably cooking magazines. First course is turtle soup for Baolu and the ubiquitous Gumbo for me. Second course is...well....I forgot to photograph it! Whoops. It was delicious. Ah, I think Baolu had Escargot and fried oysters whilst I had shrimp on grits, but lets just skip to desert. Bananas Foster - done the right way with flames leaping into the air! OK, I didn't get the BIG flame on film (cheap camera), but it was spectacular. The dessert was pretty kick too. Back to the hotel to relax and pack. Heading home tomorrow! The flight home doesn't leave until afternoon. Time enough to have another grits-encrusted breakfast at Waffle House! Return the rental car, then back to the 45 minute line at TSA. Once through, it is a short hop to Houston, TX, George Bush International where we have our last meal of southern-style seafood and gumbo at Pappadeaux Seafood Kitchen. From Houston, it is a very long, 5 hour flight back to Seattle on United. Home again! Brrrrrrr!!!!! We had turned the heat off before we left and it is 48 degrees on the thermostat! It is actually warmer OUTSIDE when I go pick up the mail. Still, good to be home after a wonderful week of some of the best, tastiest food in the world. We did NOT have a bad meal on the entire trip -- the cuisine of Louisiana is simply outstanding and we highly recommend it. Good people, good weather, good food. What else can you ask for?